This South African bulb is easy to grow. 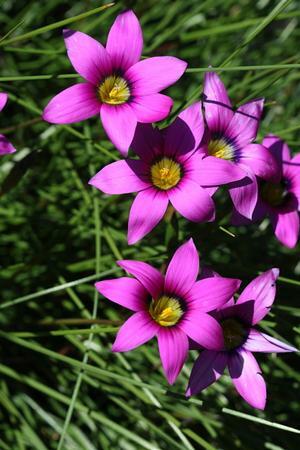 It’ll reward you with striking 2-3” purplish-pink flowers that have a satin sheen. Over time, the bulbs multiply to form a sizeable – and more spectacular – carpet of color. The Latin name honors Romulus, the legendary founder of Rome. “Subfistulosa” means “somewhat hollow” and refers to the leaves. Hollow romulea is native to South Africa where it grows on dolerite flats from Calvinia to the Roggeveld Escarpment. Roggeveld is an area that extends from Calvinia southward along the Roggeveld Escarpment to the foothills at Matjiesfontein. It's a fairly flat, rocky plain with isolated steep-sided mountains. The area's very dry with most of the rainfall occurring in winter and averaging just 125-250 mm (5-10 inches) a year. There are summer thunderstorms, but these amount to only about 20 mm of rain. Winter temperatures are cool and frost and snow is usual. Soils are fine-grained from shale or dolerite (Source: Pacific Bulb Society). This South African bulb is easy to grow. It produces clumps of bright green, upright, slender leaves that are about 8-10" tall. Over time, the bulbs multiply to form a sizeable colony. The spring-blooming flowers are carried on stems that are shorter than the leaves. They're about 1½-2½" wide and consist of 6 petals that flare outwards at the tips and are fused at the base to form an open cup shape. Their color's stunning; a bright neon carmine pink! As you'd expect from its natural habitat, romulus prefers a sunny spot with good drainage. It needs a dry period after flowering, so there’s no need for water in the summer after flowering’s finished. You don't need to replicate the rocky, nutrient-poor soil of hollow romulus' native habitat. However, it does need to be planted in a soil that drains freely and is fairly dry in the summer after blooming's finished. The bulbs will rot if they're in a completely waterlogged soil for prolonged periods of time in the winter. They'll also rot in a soil that's wet in the summer during the bulb's dormant period. Hollow romulus puts on most of its growth during the winter months and needs to be dry during its dormant summer months. Therefore, it shouldn't need any additional water. We're not aware of any pests or diseases that affect hollow romulus. Spring-flowering bulbs that go dormant in the summer can be a great way of introducing a lot of water-wise color into the garden. Hollow romulus blends well with California native bulbs such as blue dicks (Dichelostemma capitatum), mariposa lilies (Calochortus spp.) and Ithuriel's spear (Triteleia laxa). It also combines well with traditional spring-flowering bulbs such as miniature daffoldils. Hollow romulus works well in rock gardens and meadows. It also looks great planted between clumping grasses or shrubs on banks. This easy-to-grow bulb needs hardly any maintenance. Occasionally, you may want to pull out a dead or discolored leaf if you're fussy!